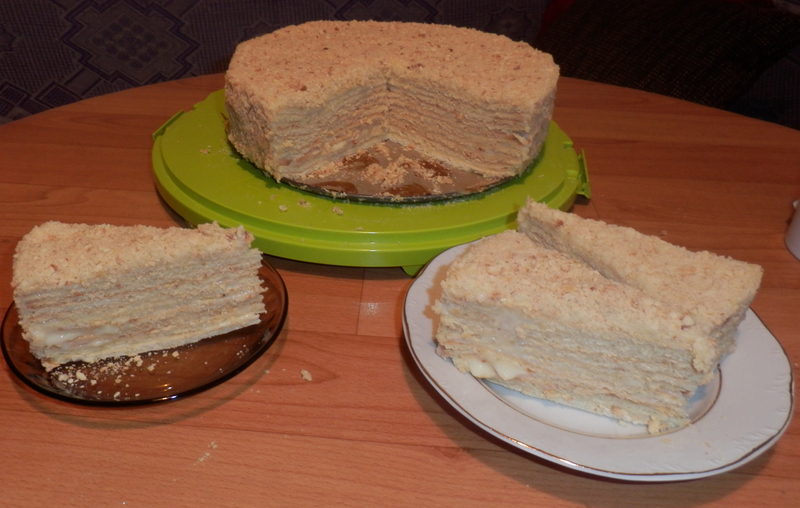 Honey Cake Recipe with butter cream.6 eggs are broken very well together with 100g. sugar and 100 g of honey. To this is added melted cow’s butter 200g. The egg mixture bowl is transferred to a water bath and stirred continuously for about 10 minutes with a silicone stirrer. In another bowl, add 700 g of flour and 1 ml of bicarbonate, pour the prepared egg mixture, stir until a smooth dough is obtained. Dough is divided into 10 balls, placed in a tray, covered with fresh storage foil and placed in a refrigerator for 30 minutes. Then take one of the balls and roll on a sheet of parchment paper with a round shape and a diameter larger than the shape of a cake. Bake in a 250-degree oven, with a fan, until golden (3-4 minutes). 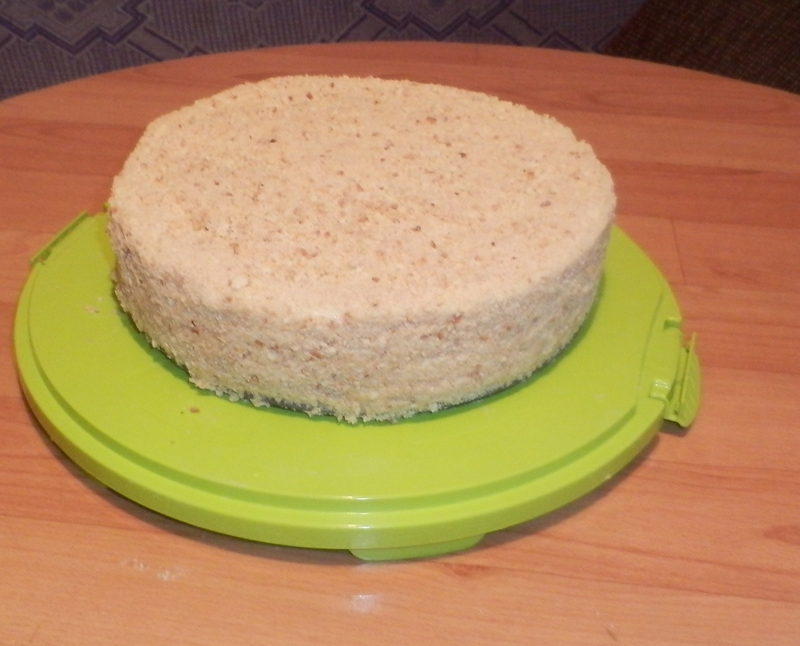 After being removed from the oven, it is cut with a knife using the shape in which the cake will be arranged (26 cm in diameter). It is cut while it is warm, because it then hardens. This is how the other swamps are baked. The cuttings are ground and preserved for decoration. 1 liter of milk (set 1/2 hour) is boiled with 300 g of sugar and the vanilla pod, cut into two. 5 tablespoons are reconstituted in the milk. The vanilla pod is removed, the milk dissolved in the milk is poured into a fine juice while stirring continuously. Leave on the heat until it thickens, then transfer to the bowl. Cover with a foil for fresh storage and allow to cool well. 300 g cow’s cream oil (softened to room temperature) is shaken with a blender until it becomes white. Add the cold cream to it, stir until a homogeneous mixture is obtained. 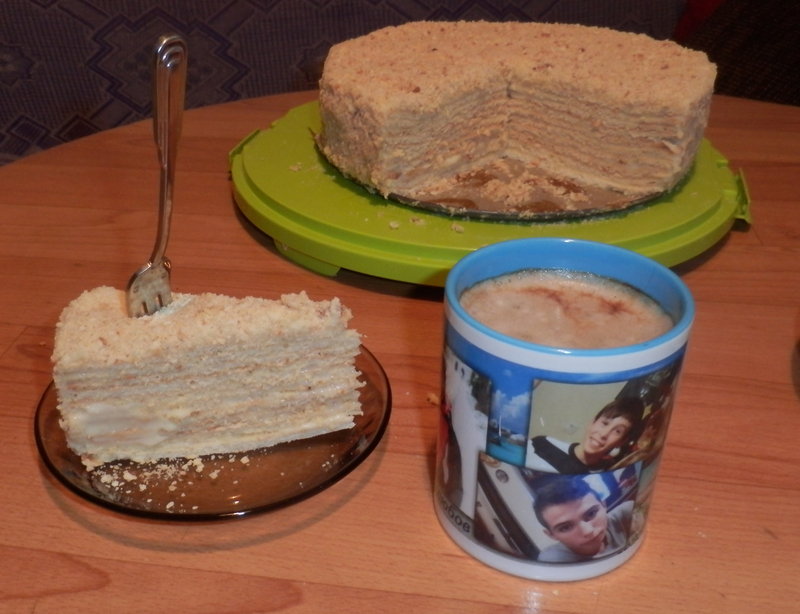 One of the marshes is placed in a cake shape, smeared with a portion of the cream, a second swamp is placed, it is well coated with fresh milk and then with butter cream. It is good to fork all the swabs and to syrup more with fresh milk because the cake becomes dry. The operation is repeated until all the blades have finished. Part of the cream should remain for the wall painting. Leave the cake in the refrigerator for at least 4-5 hours. It is then removed from the mold and smeared with the cream. Sprinkle with the ground clippings from the marsh. Served with honey.